They say they cremated multiple bodies at once..it didn't take 2-3 hrs like todays process..Also, didn't need coffin which would make it take longer. They say the rest of the people not cremated are in mass graves or just laying there in piles along the grounds,etc. How do you respond to their claims? If you could respond to me like a 5 year old that would be great,lol..because then i could understand it then try and relay this info to somebody else.. Thanks! The storyline debunks itself on an endless number of points. It's all here, per your OP try our search function for cremations or mass graves, etc. Also search the CODOH main site at http://www.codoh.com It has enormous amounts of well researched scholarly material. The complete lack of human remains as alleged is certainly at the top of the heap. I'll summarize. But first of all, cremations do not make human remains disappear. Simply ask your local crematorium. There are many pounds of bones, ashes. etc, per corpse. So right away we see a common deception used by the "Holocaust Industry" debunked. IF the impossible narrative was real there would necessarily be immense amounts of human remains in one form or another. Of course, "The Industry", while trying to get away with implying that Nazis made the remains disappear, contradict themselves, such as this claimed “ash pond” for 1,100,000 Jew remains at Auschwitz, no actual remains can be shown. And this Sobibor ‘monument’ supposedly over the remains of 250,000 Jews, actual remains of the alleged 250,000 cannot be shown. And the alleged location of Treblinka mass graves / remains of 900,000 Jews according to Treblinka officials, no alleged remains can be shown. - So let's actually recall what the impossible storyline says. It says that 6,000,000 Jews, AND 5,000,000 others were murdered in the same ways in very centralized sites where enormous mass graves are alleged to still exist in locations that are supposedly none. - However, not a single one of these alleged enormous mass graves has been excavated, it's contents verified and shown. NOT ONE. We're talking about an alleged 11,000,000 people. - Again, recall 900,000 Jews supposedly buried at Treblinka, 1.250,000 human remains alleged at Auschwitz, 1,250,000 supposedly buried at Sobibor, AND 34,000 Jews supposedly buried at Babi Yar, on & on. But yet we do not see what is claimed. Anyone can look, we see no verifiable, reviewable, victims ID'd, witnessed by observers, documented, and photographed. Yes, they have tried to find the claimed massive remains and completely failed. That still doesn't stop them from saying the remains are actually there. Zionist dishonesty is what the 'holocau$t' storyline is all about. The builder of the disease control crematory facilities at Auschwitz stated that the ovens would be damaged if they cremated more than one corpse per muffle / oven. "How many bodies were cremated per hour at Auschwitz?" "In a crematory with 5 ovens and 15 muffles, fifteen bodies were cremated." This means an average cremation time of one hour per body per muffle and indicates that the theoretical maximum capacity of Crematory IV (and each of the ovens of Crematory V as well) in a 24 hour period was 192 bodies. "I have mentioned the enormous load to which the overtaxed ovens were subjected. I told Chief Engineer Sander I was worried about whether the ovens could withstand the excessive load. In my presence, two bodies were placed in one muffle, instead of a single body, and the ovens were unable to handle the load"
SS Kurt Prufer, told the officers of SMERSCH (according to documents found in the Moscow archives) that only one body at a time could be cremated per muffle and that the cremation time took 60 minutes, and that they tried to cremate 2 bodies at a time; but the temperature inside the muffle went so high that it damaged the oven. - There was a total 52 muffles of Auschwitz, never used simultaneously. - 38 is the most that were ever online simultaneously. I'm sure more will be more forthcoming. BTW, please read the guidelines which help in making debate orderly & easy to follow. Especially 'one topic per thread'. As Hannover pointed out, cremations do not make human remains disappear. Millions of teeth would be found on the site. For Auschwitz only : 1.1 million bodies in ashes = 3000 metric tons of ashes, and maybe more. Marley775 wrote: As Hannover pointed out, cremations do not make human remains disappear. Millions of teeth would be found on the site. In reality the trucks were far smaller back then so each truck would probably only take a couple of tons. It is easy when looking for nthe killer riposte to the pro holocausters to forget the bleeding obvious; that there are no mass graves and no human remains which amount to very much at all. 6m dead people simply do not disappear. So where are they then? By going into the technical issues of the crematory furnaces as espoused by Deana and Mattogno in "The Crematory Furnaces of Auschwitz" or "Real Case for Auschwitz" you run a long winded battle with a liar or believer to establish the obvious. However I have found that the very pertinent point that the refractory brickwork could have only very generously ever have allowed 135,000 absolute theoretical maximum to be cremated (in line with the real number of dead at the camp) for the whole camp (inc. Auschwitz 1 as well), and the fact that none of them were ever refurbished as a very fast way to KO that lie quickly which I have never encountered any difficult with during frontline battles- it always seems to serve to put the opposition on the back foot. 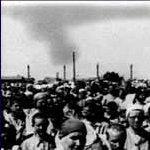 "Open Air Cremations at Auschwitz"
Millions of teeth would be found on the site. I used to think that too, but talked to a person who cremates bodies and he said the teeth go. They evaporate. Well, I don't know who you talked to. That's hearsay and it is not true. The remains after cremation consist of bone fragments and teeth. After cremation, a bone crusher is used in order to turn these fragments into a powder. Since no bone crushers were used in Auschwitz, these bone fragments and teeth should exist.